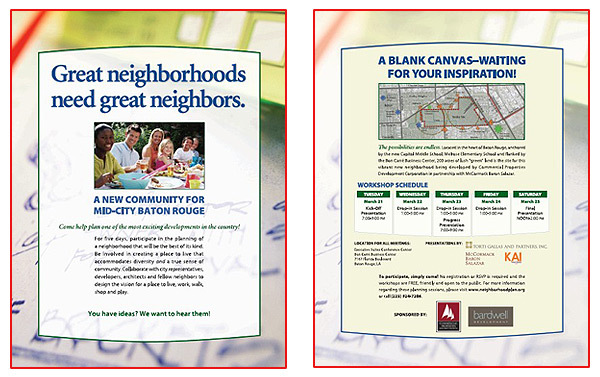 Promote and drive attendance for a week-long planning workshop to design a 200-acre TND (Traditional Neighborhood Development) located in Mid-City Baton Rouge. In order to meet a fixed LIHTC (Low Income Housing Tax Credit) application deadline, planners and developers needed to conduct a series of “charrettes” with less than three weeks to promote the event. Develop marketing and media strategy, positioning messages and rationale. Create and produce ZAPP (Zoned Area Pre Print) newspaper flyer and radio copy. Coordinate e-vite and website production. Write press releases and coordinate with local media for editorial board reviews. Provide on-site assistance, follow up and coordination for Low Income Housing Tax Credit application.